• Competing bipartisan resolution says troop increase "not in the national interest"
• Sen. Chuck Hagel, R-Nebraska, calls Iraq war "dangerous for our country"
WASHINGTON (CNN) -- Republican Sen. Susan Collins of Maine on Thursday told CNN that she is working with colleagues on "both sides of the aisle" to come up with a resolution opposing President Bush's plan to increase troops numbers in Iraq -- after she and other Republicans objected to certain language in a resolution proposed by three other senators. Collins and other Republicans opposed to the president's plan to send an additional 21,500 troops to Iraq objected Wednesday to language in a resolution sponsored by Democratic Sens. Joe Biden of Delaware and Carl Levin of Michigan, and Republican Sen. Chuck Hagel of Nebraska. "What I'm trying to do is to work with a group of colleagues to produce a resolution that would put the Senate firmly on record as opposed to the president's plan but would do so without taking on controversial or extraneous issues that are unrelated to Iraq," she said. "The Biden resolution has a bottom line I agree with, but there is language I disagree with," she said. On Wednesday the bipartisan trio of senators unveiled a resolution saying, "It is not in the national interest of the United States to deepen its military involvement in Iraq, particularly by escalating U.S. troop presence in Iraq." Later Wednesday, Republican Sen. Olympia Snowe of Maine agreed to co-sponsor the bipartisan resolution, saying that "its focus rightly hinges on a diplomatic and political solution, as a military solution is no longer feasible in Iraq." During a Senate Foreign Relations Committee hearing Thursday, Biden said he was open to alternative language. "This is a process. If you have 10 Republicans saying, 'I don't like the word "escalate," I like the word "increase," ' or whatever, that's not a problem," Biden said. "There's no pride of authorship in the use of specific words." The nonbinding resolution is not expected to offer any alternative to Bush's plan to send 21,500 additional troops to Iraq for deployment primarily in Baghdad. Speaking Wednesday on CNN's "The Situation Room," Hagel said Congress needs to be more assertive in determining U.S. policy regarding what he called a civil war in Iraq. "We are no longer just going to quietly stand by, as we have done for the last four years, and let our young men and women be thrown into this conflict when they cannot affect the outcome," Hagel said. "This is the biggest issue facing our country since Vietnam," he added. "It's dividing our nation. It is dangerous for our country. It's dangerous for the world. The Congress needs to be part of this." Democratic Sen. Barack Obama, of Illinois introduced a bill Thursday on the Senate floor to cap the number of troops sent to Iraq. "It now falls on Congress to find a way to support our troops in the field while still preventing the president from multiplying his previous mistakes," Obama said in a statement. "That is why I not only favor capping the number U.S. troops in Iraq, but believe it's imperative that we begin the phased redeployment I called for two months ago." Obama's legislation is similar to two bills proposed Wednesday by two other potential Democratic presidential candidates -- Sens. Hillary Rodham Clinton of New York and Chris Dodd of Connecticut. During a news conference Wednesday, Clinton said she proposed the troop cap because the Bush administration is pursuing a "losing strategy" in Iraq. CNN's Ted Barrett, Dana Bash, Hank Bishop, Andrea Koppel and Deirdre Walsh contributed to this report. 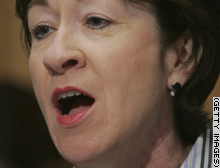 Sen. Susan Collin, R-Maine, disagrees with the president's plan to send more troops to Iraq but does not back a bipartisan resolution.